A recent report from Landcare NSW shows the value of community Landcare in the State to be $500M, and that's just what the economists had data for. It also highlights the importance for community Landcare to be properly supported by government. In NSW 66 Landcare facilitators are funded, with the program run in partnership with Landcare NSW. Read the story from the Landcare NSW website. Pictured (L to R): Aurecon Senior Economist Kapil Kulkarni, Landcare NSW State Landcare Facilitator Sonia Williams, Local Land Services Landcare Program Manager Chris McCulloch and Landcare NSW Chair Rob Dulhunty. A study released estimates the net benefits delivered by a supported NSW Landcare community to be $500 million a year, based on the data available. The report by Aurecon Infrastructure Advisory, commissioned by Landcare NSW with support from NSW Local Land Services, studied Landcare in selected regions, identifying and confirming substantial economic value. The study reviewed the literature, summarised data and applied economic valuation techniques to estimate the significant contribution Landcare makes in NSW. Landcare NSW Chair Rob Dulhunty was pleased with the report’s findings, but not surprised. “Anyone associated with Landcare will testify to the value it provides. The outcomes Landcare generates for the environment, agriculture and people are widely known. This study puts a dollar value on these benefits,” said Mr Dulhunty. Aurecon’s assessment of the benefits of Landcare in NSW shows the impact of a supported Landcare network is significant. 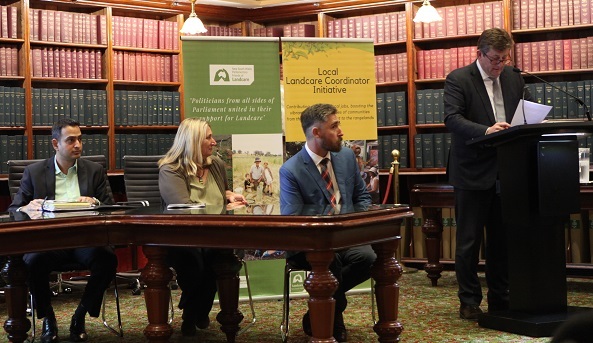 It highlights the importance of the contribution made by Landcare NSW, through its role as a statewide peak body and through programs such as the Local Landcare Coordinator Initiative which it jointly manages with NSW Local Land Services, in helping achieve these outcomes. The study’s author, Senior Economist, Kapil Kulkarni, presented his findings from this landmark research at a forum held at Parliament House in Sydney on 21 June 2018. “The Aurecon team learned a lot about Landcare during the study and we were amazed by how much of a difference Landcare makes to communities and the environment across NSW. “We couldn’t quantify the benefits of all activities. However, we found significant economic benefits associated with the subset of activities we could value. The benefits are likely to be larger than what we are able to estimate based on the available data,” said Mr Kulkarni.